A very muddy day out! On Sunday 10 May, the TDP led a guided walk to the Custom House site for FROG members and friends. Although the conditions underfoot were a little hard going (and obscured the surface finds scatters somewhat! ), we were able to visit the key structures the FROG teams have been recording during the training days in February and April. These include the two vessels located in the eastern part of the site, the causeway and riverside wall, and the Custom House grid iron. We also visited the foreshore under Billingsgate wharf. Beneath the modern jetty there are a number of earlier wharf structures, including one recorded by the FROG in February 2009. This is a particularly interesting feature, as it seems to incorporate both earlier revetments and the remains of a grid iron. 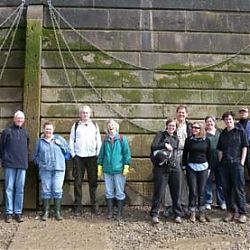 Finally, we walked along to the wharf structure first recorded by the Thames Archaeological Survey during the 1990s. Again, this is a complex feature, representing a number of phases of construction and including a large number of reused timbers, possibly derived from domestic buildings. We hope the FROGs and friends enjoyed the tour and look forward to seeing you all at future events!